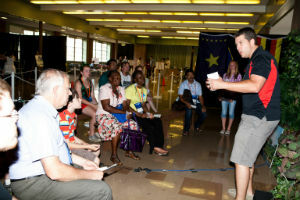 At the Spread the Word connector on the afternoon of Tuesday, June 25, participants were given the opportunity to see how God is at work around the world through this primarily student-funded organization. Since Spread the Word was launched at IYC 2002, Church of God students have been making an eternal investment by sending tools for evangelism across the globe. More than $650,000 has been given, with equipment now in use in thirty-four countries. Originally scheduled to take place in the Big Tent, the event was moved to Park Place Fellowship Hall due to the vagaries of summer weather. Upon entering the hall, guests viewed an introductory video, produced by Vence Vida. This three-minute film gave a brief explanation of Spread the Word and featured clips of actual STW equipment in use in India. After this, “passports” were distributed, and groups were guided through the various “continents” to see how STW funds are being used in different locations. At the Africa exhibit, an island village was the setting for a solar-powered presentation of the Jesus film. A visit to the Asia section allowed volunteers to “race” a bicyclist on a simple course to demonstrate the importance of transportation in remote regions. Guests were able to learn about a youth café abroad and saw examples of the 5 Principle curriculum that has been translated into multiple languages. All of these areas were representative of some of the projects Spread the Word has sponsored. The South America exhibit featured a mock radio station, and stories about lives changed through Paraguay’s Radio Alternativa were shared. A community party atmosphere allowed participants to enjoy fun and fellowship in the Australia and North American area. Booths with further information about Spread the Word and STW Internships were available for those who wanted to learn more about this organization. This entry was posted in All Church of God, Global Gathering, Global Strategy, Youth Ministries and tagged Global Gathering, Spread the Word, STW, youth. Bookmark the permalink.